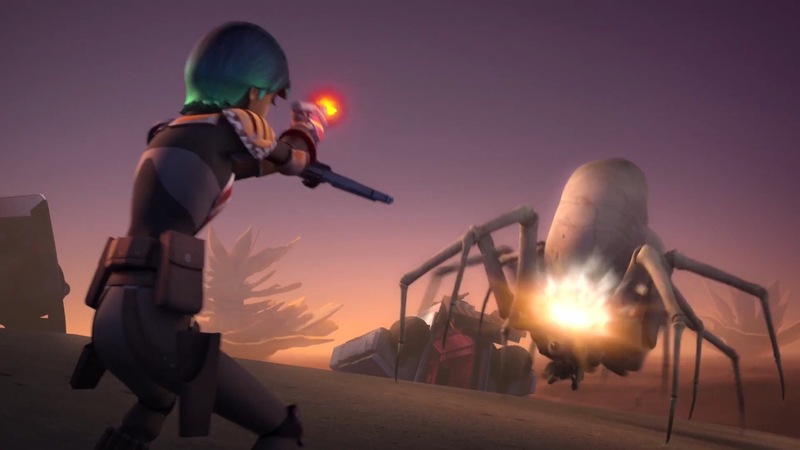 It appears as though Lucasfilm was waiting until after The Force Awakens arrived to show off their big guns on Rebels, the popular animated series which takes place a handful of years before A New Hope. And this trailer has blown me away. If you haven’t watched it, beware – it’s quite spoilery, but it’s also just so awesome. After the trailer, I break it down, frame by important frame. 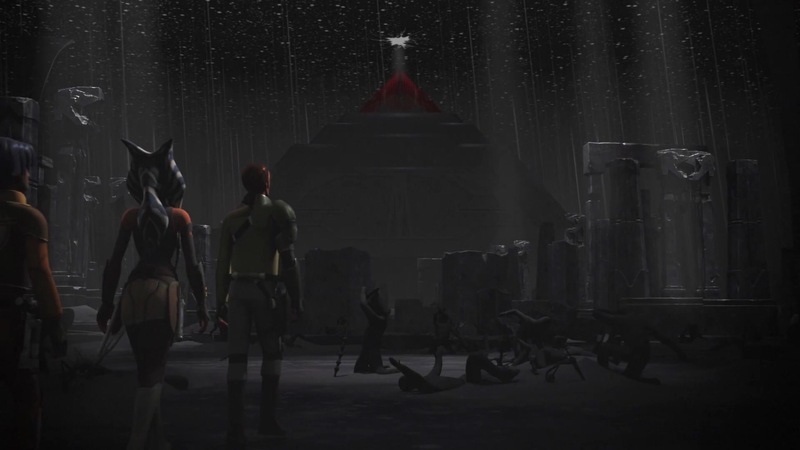 0:00-0:04 Ezra, Ahsoka, and Kanan standing at a precipice overlooking what appears to be a city in ruins. The pyramid at the forefront is intact, and could be of either Sith or Jedi origin. A strange light is illuminating the red tip. 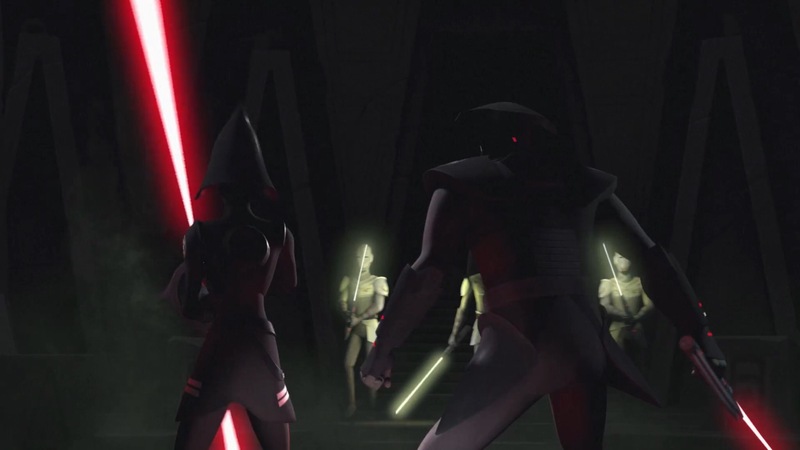 0:05-0:09 “To defeat your enemy, you have to understand them.” The enemy Ahsoka is referring to would most likely be the Sith. 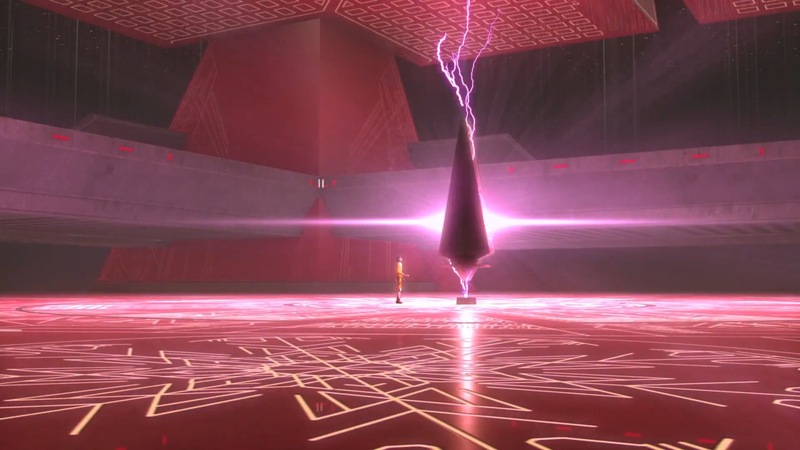 So it appears that pyramid will be a Sith Temple. We see some glowy artifacts and even beams of red energy. 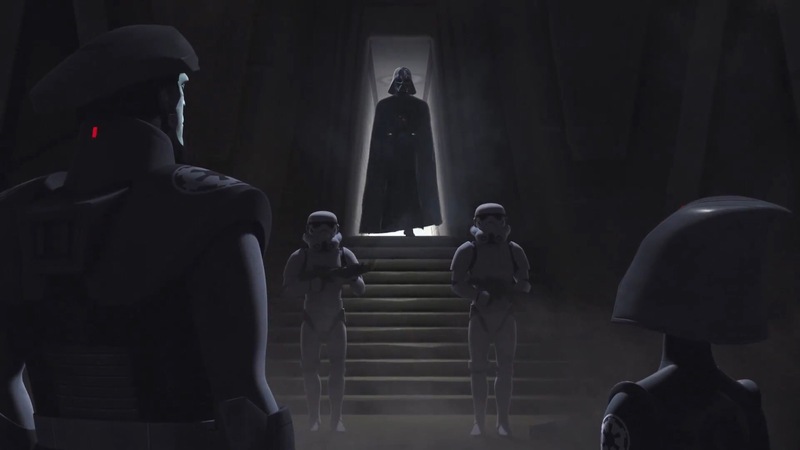 0:10-0:15 Vader is still on the hunt for the Jedi, and is in direct contact with his Inquisitors. 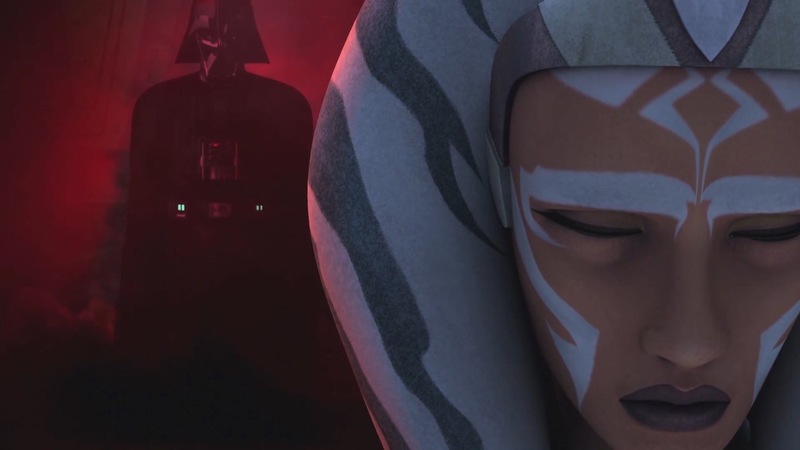 0:16-0:20 Ahsoka continues, “There’s always a bit of truth in legends.” This line could very well be very significant. 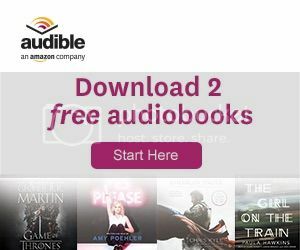 The Expanded Universe, or all the books and comics that were created prior to there being a cohesive canon universe, is now printed under the Legends banner. Could this be confirmation that certain elements of the EU will be incorporated back into canon? 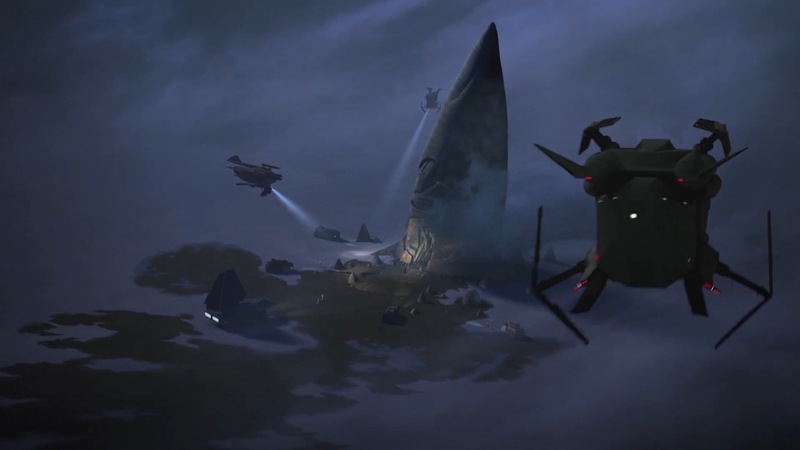 0:21-0:26 “The Empire’s making our travel around the Outer Rim harder all the time,” says Kanan, as we see the Ghost and other ships under attack. He could be referring to all the Rebels. 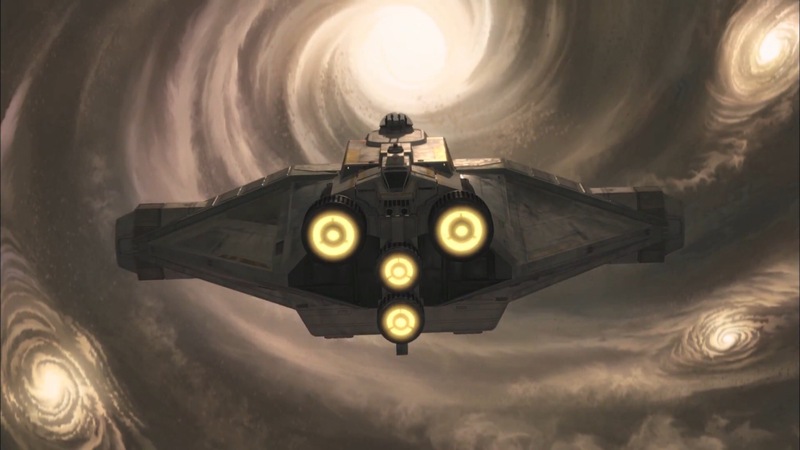 We see an A-Wing get hit. 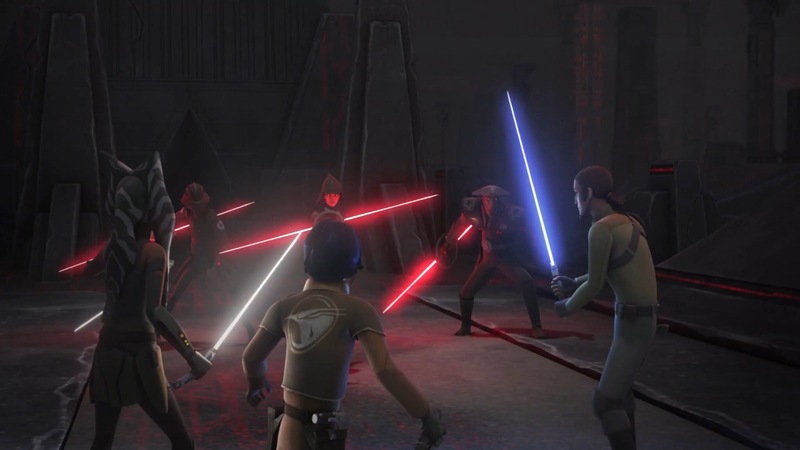 0:27-0:33 Ezra and Kanan face off against the inquisitors. 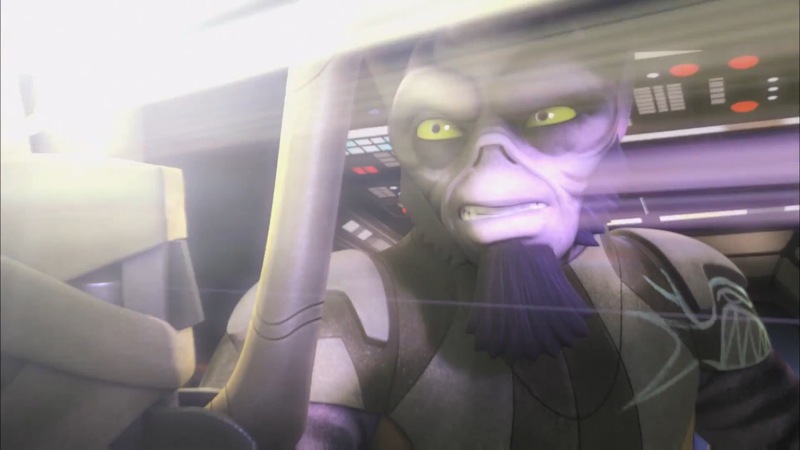 Kanan narrates, “Everywhere we go we run into those guys. 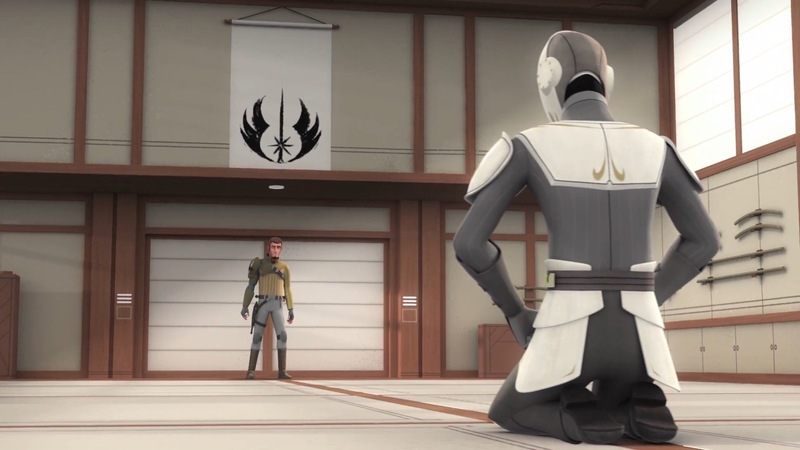 If this keeps up, we’ll never be able to establish a base.” This could be referring to the Empire’s offense, or more directly to said Inquisitors. 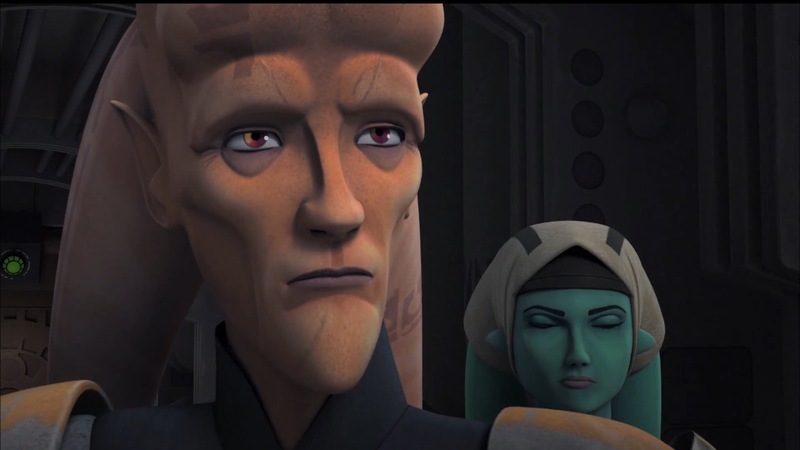 0:40-0:43 We’re introduced to Cham Syndulla, Hera’s father. 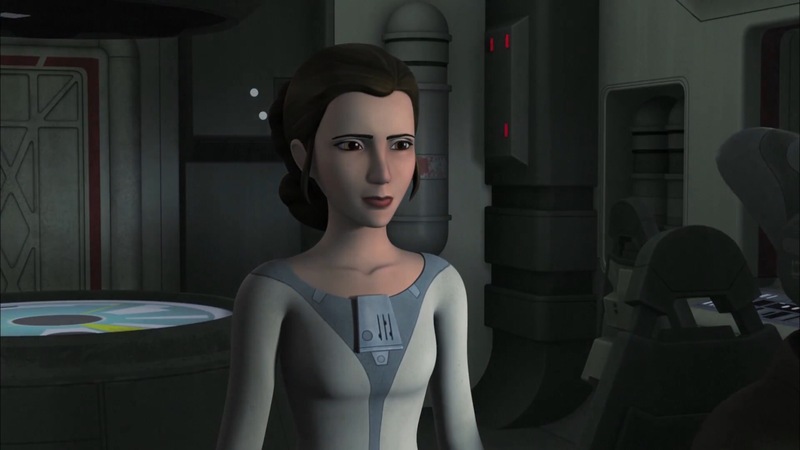 Cham started the very first Rebellion cell against the Empire with the Free Ryloth Movement. This is likely part of Bail Organa’s reinforcements. 0:43-0:55 Princess Leia Organa could also be part of those reinforcements. But she’s only about 16 years old at this point in time, and I feel as though it’s more likely she chose to help out the team on her own. “I feel like because I can fight, I have to for those who cannot, and I feel like you might be the same way,” she says to Ezra. I’m not sure about the voice they gave her. Sounds more like Carrie Fisher than Leia to me. 0:55-1:10 We get a montage of the entire Ghost crew in action sequences, including space-diving, more space whales, lightsaber battles, and some awesome gunslinging. 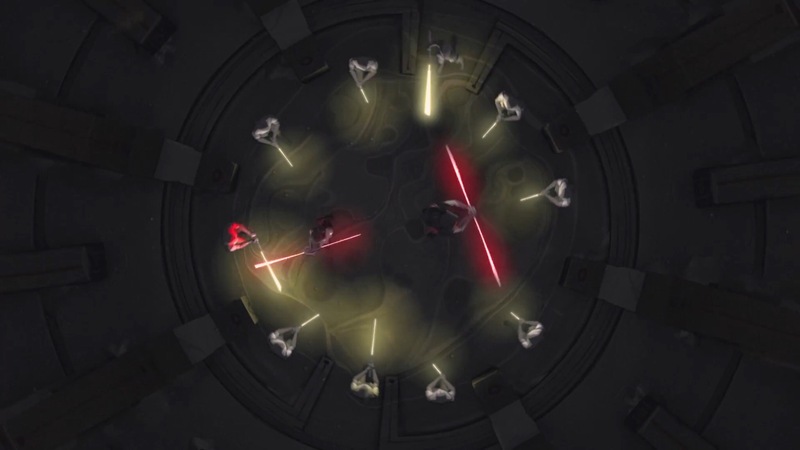 1:11-1:14 There looks to be a six-way lightsaber duel which includes Ahsoka and a new Inquisitor we have yet to see. 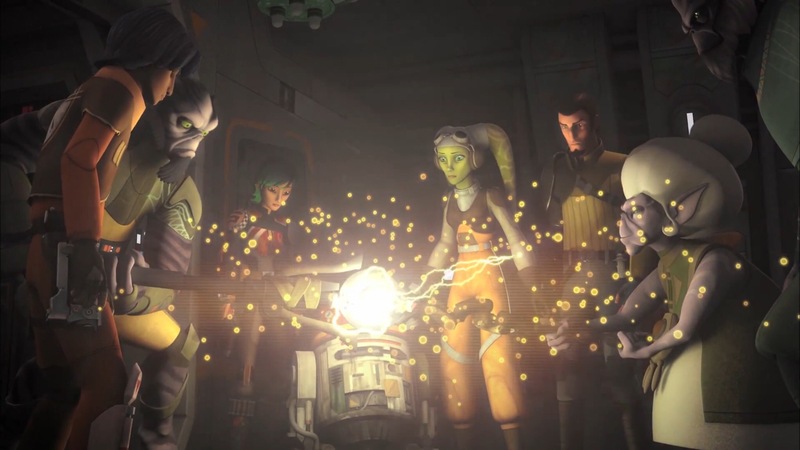 “The Jedi are growing in their power,” the male Inquisitor states. 1:14-1:16 There appear to be more Jedi, or Jedi-like groups around than we thought. 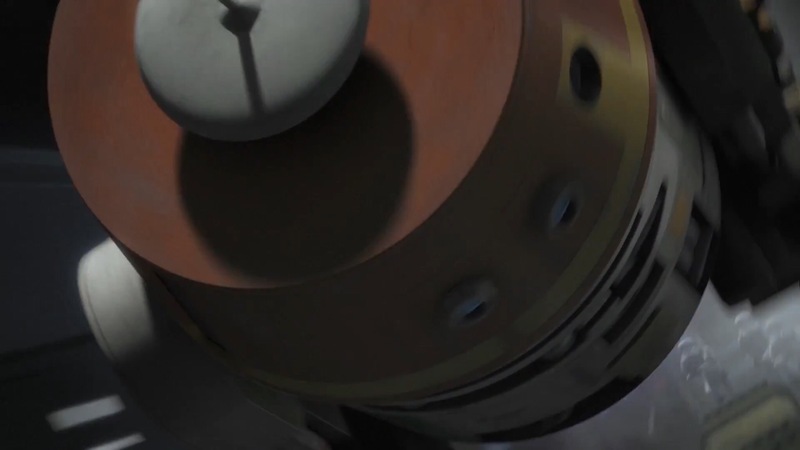 These hold white, or beige-yellowish lightsabers. 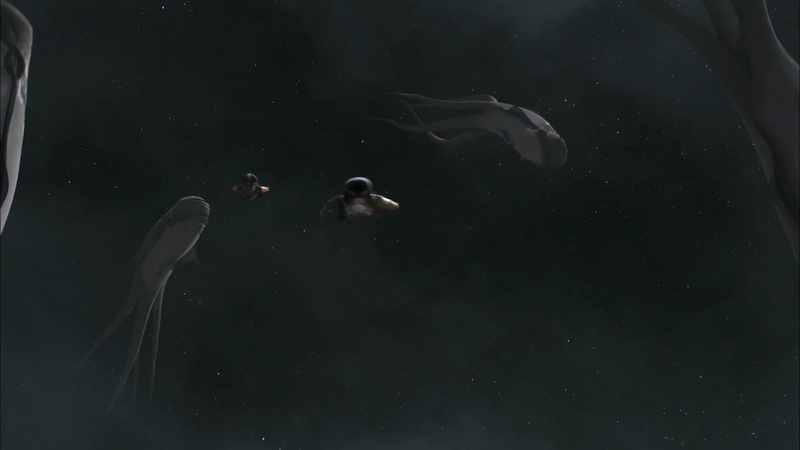 There are at least ten of them attacking the Inquisitors. 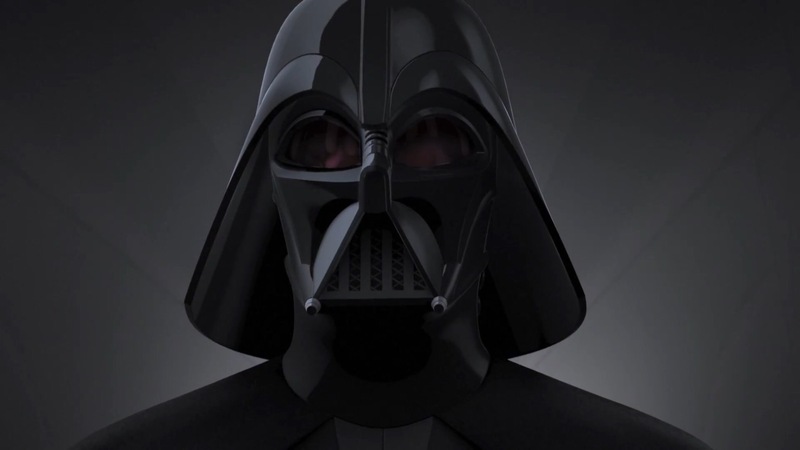 1:17-1:18 Darth Vader: “It will be their undoing.” This might mean that, as the Jedi grow more powerful, they grow more vulnerable and can be smoked out easier. 1:19-1:25 More stuff. Chopper gets some action. 1:42-1:52 We see a larger shot of the ringed planet, and notice the strange floating band of asteroids closer into the planet. 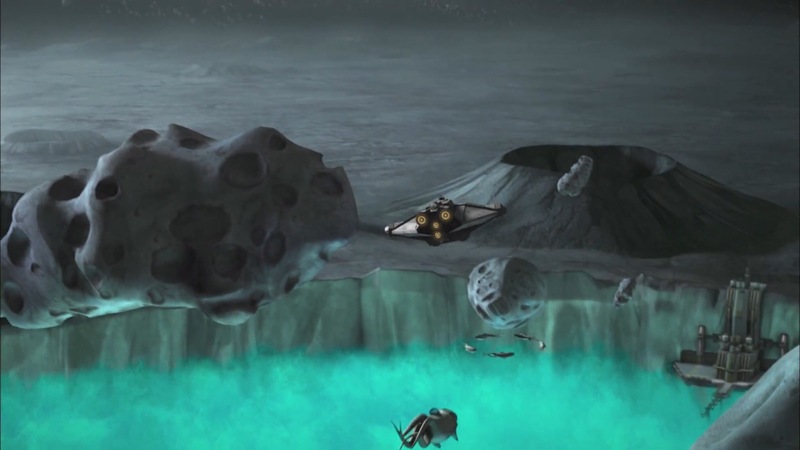 That appears to be where Ezra is riding one of those Space Whales. 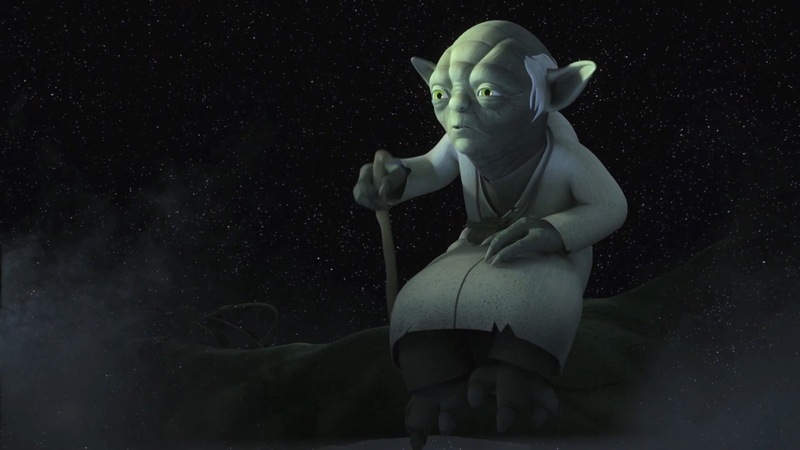 “Growing, your abilities are. And with them, danger,” Yoda says. 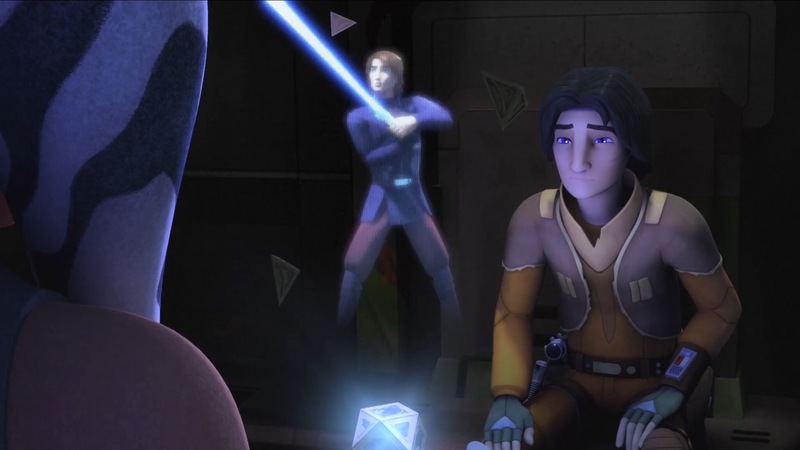 We also see Zeb channeling some sort of energy wielding stick, in which he needs both Ezra and Kanan’s help with. 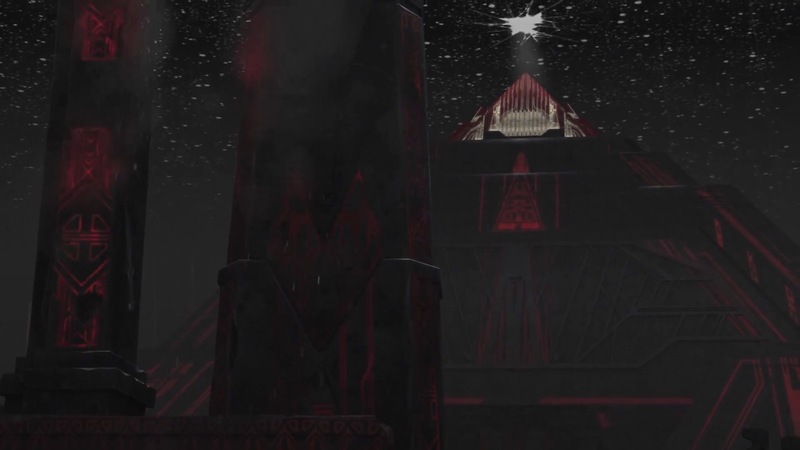 And another shot of the Sith Temple – notice the rift in the stars, just above the pyramid. 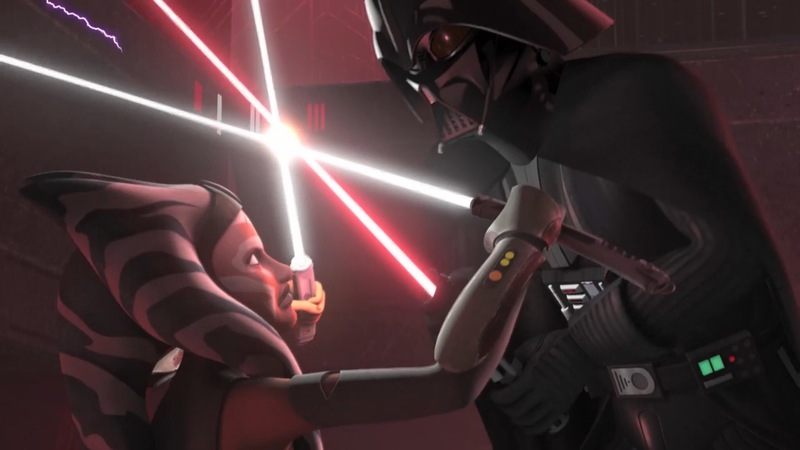 1:52-1:59 Ahsoka Tells Ezra about Anakin, her Master. 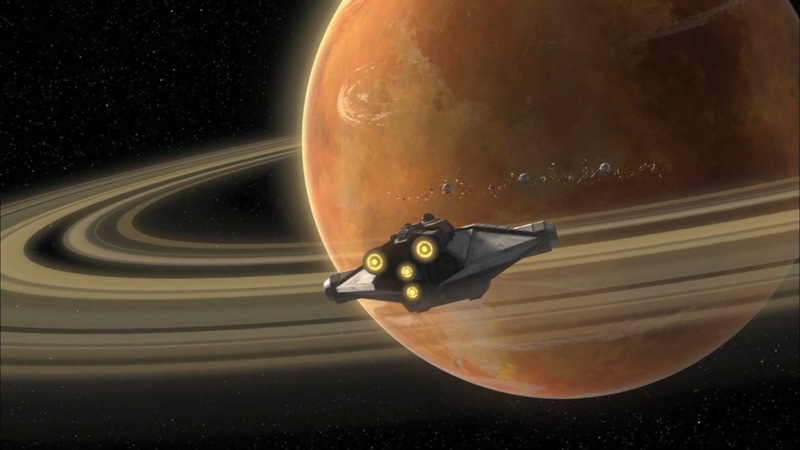 2:00-2:04 It looks as though we’re back on Lothal. 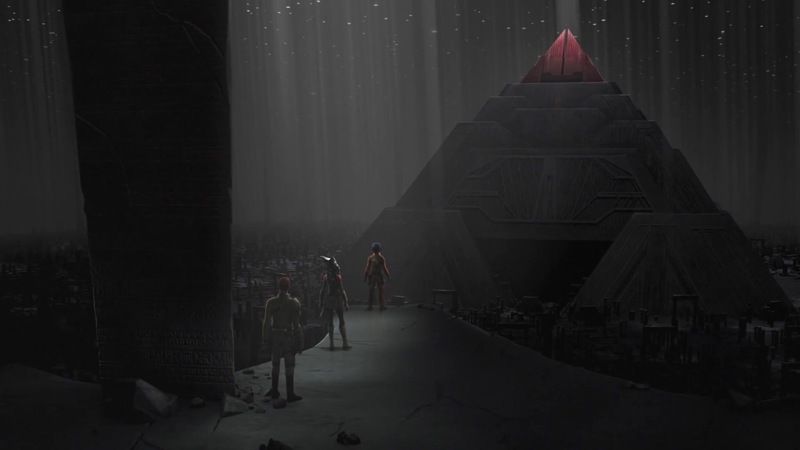 Perhaps the same Jedi temple Ezra and Kanan found there in ‘Path of a Jedi’. 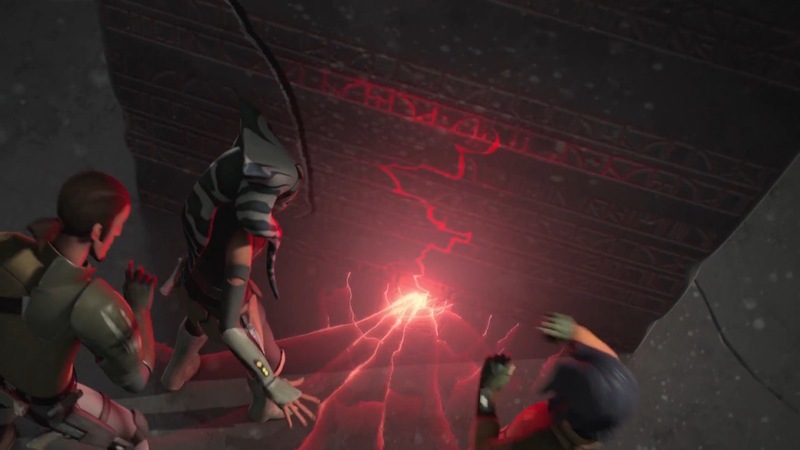 And it looks as though Ezra, Kanan, and Ahsoka are about to be captured. 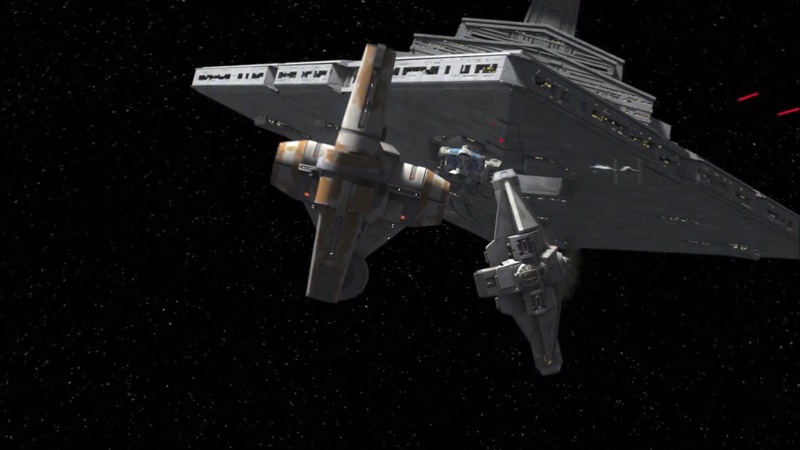 Notice the Imperial Troop Transports on the ground and the Y-Wing. 2:04-2:08 One of those mysterious Jedi in White speak to Kanan in a sparring room that looks unlike anything we’ve seen of the Jedi Temples on Coruscant. He holds two lightsabers. 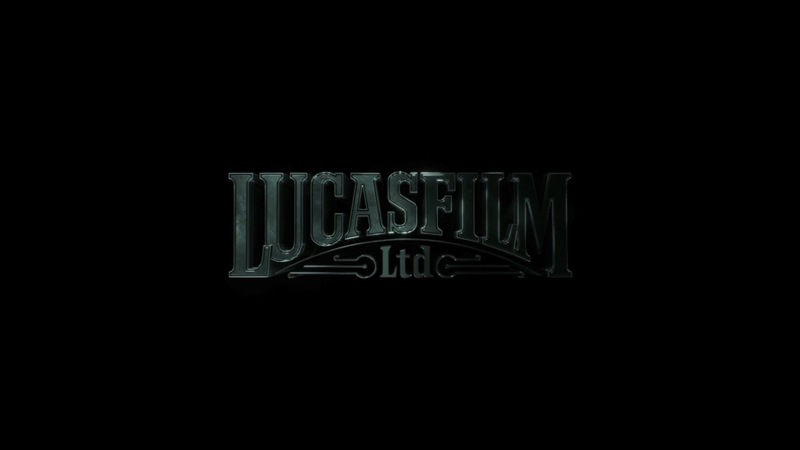 The Jedi symbol is drawn crudely on a banner. 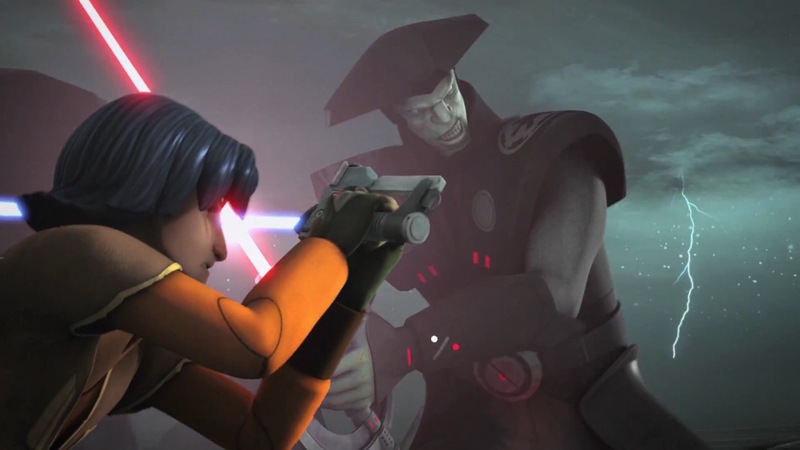 He tells Kanan, “The Dark Side – it pulls at him,” referring to Ezra. 2:09-2:15 “It calls to him,” he continues. He appears to be in a Sith Temple, the one we noted earlier. 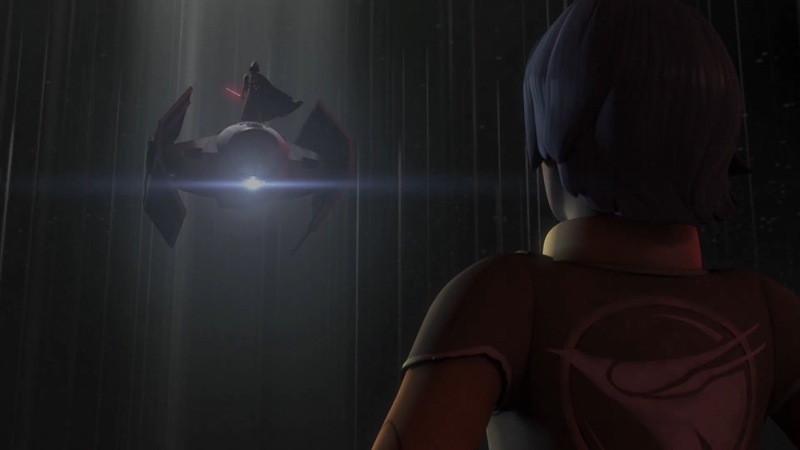 Ezra even removes something from the Temple, a glowing red artifact. 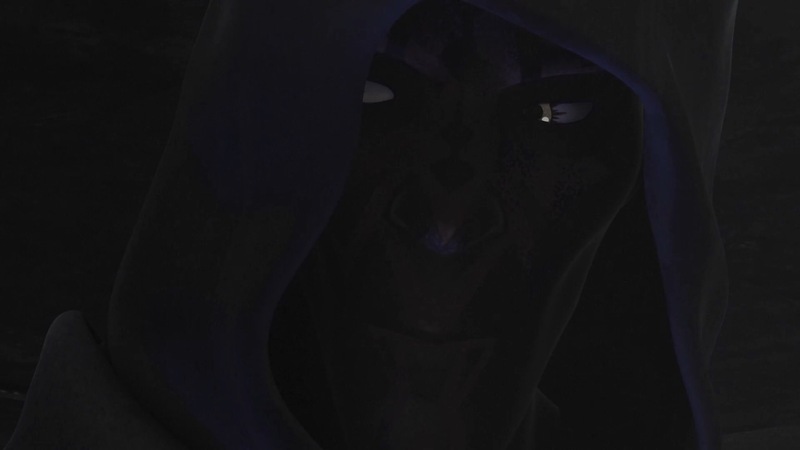 2:16-2:26 A mysterious, old voice says to Ezra, “You seek knowledge… Call me Old Master.” If you look at the person under the hood, and turn the brightness all the way up, you’ll note that it appears to be Darth Maul – in fact, his tribal tattoos match those of Darth Maul. It looks as though Ezra will take a trip down the Dark Side. 2:27-2:29 The Ghost is about to enter the eye of some incredible storm, or a worm hole of sorts. 2:30-2:37 More action scenes. Some witty banter. 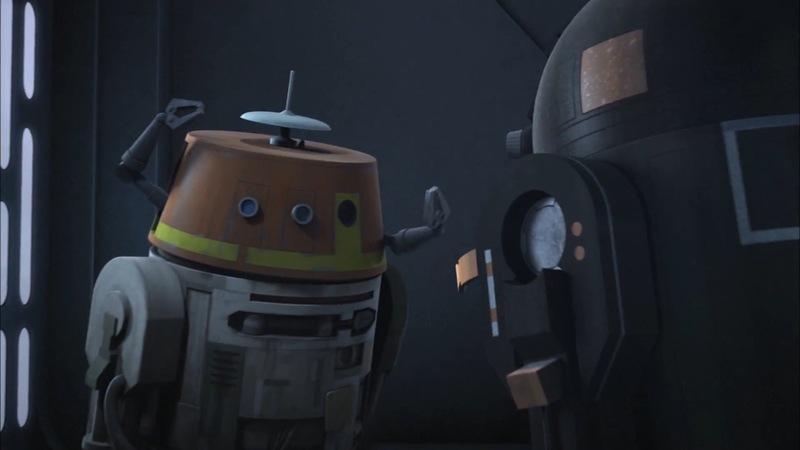 Chopper shows his skills in an astromech battle. 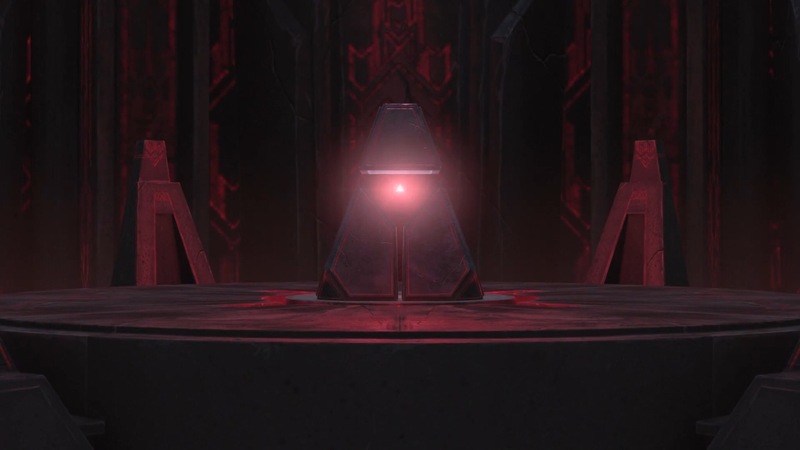 2:38-2:40 Ezra touches a pillar that he clearly wasn’t supposed to – likely the large pillar just in front of the Sith Temple pyramid. This causes things to light up and activate. 2:40-2:45 More action sequences. 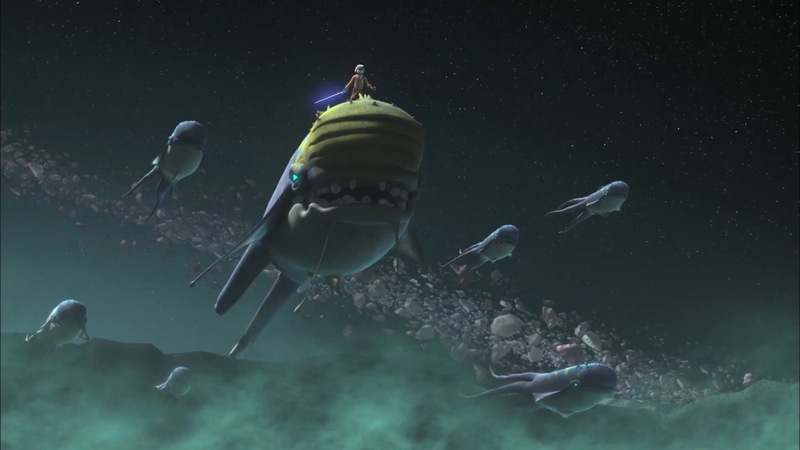 Zeb is NOT the only Lasat in the galaxy. Look at that energy-wielding stick we saw earlier in the episode. Two older Lasats are opposite him. 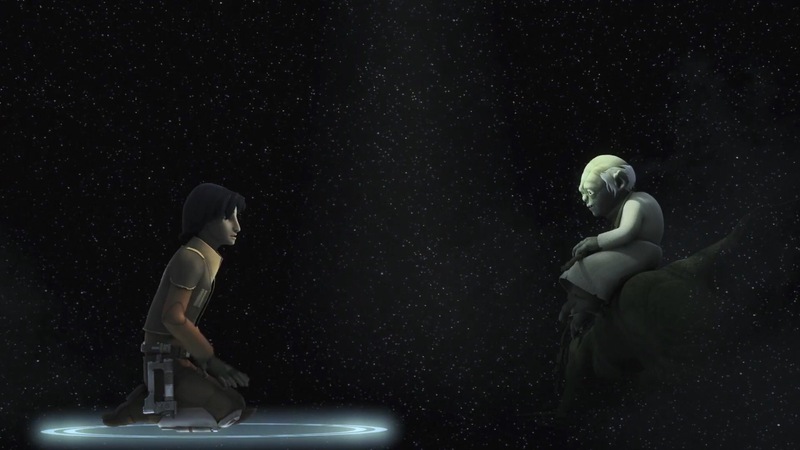 2:45-2:52 Ahsoka meditates in a Temple alone, and she hears the voice of her former Master, Anakin. “Ahsoka… Why did you leave? Do you know what I’ve become?” This is part of a Force Vision she has, and upon learning his fate, she lashes out. 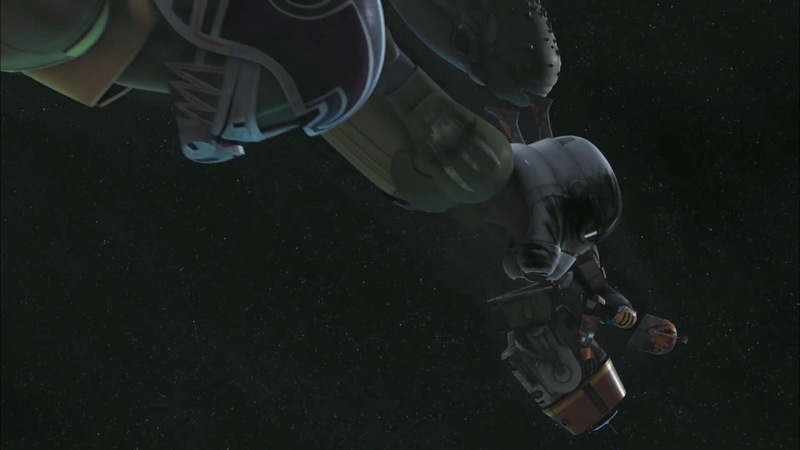 Also we see that sick shot of Vader on top of a Tie fighter. 2:55-2:58 More actiony things. 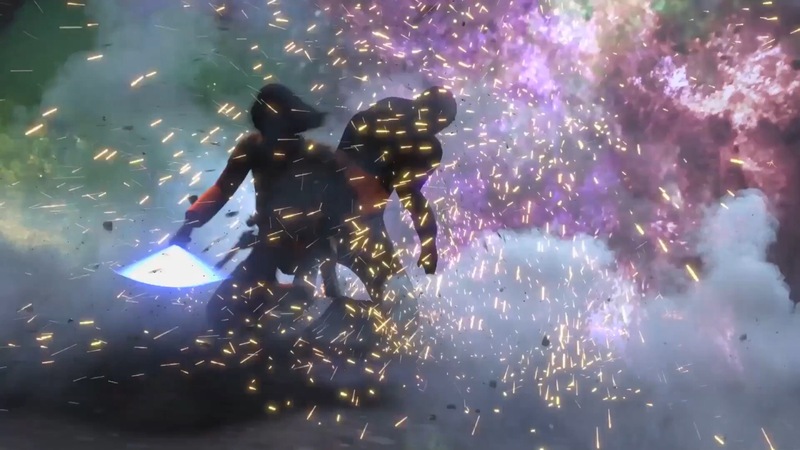 A strange purple explosion occurs during an Inquisitor encounter. 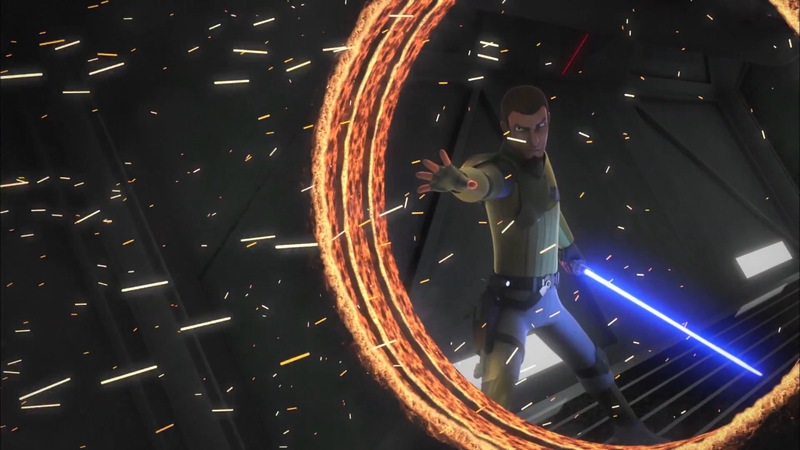 Kanan dual-wields lightsabers while facing down three of those mystery Jedi. 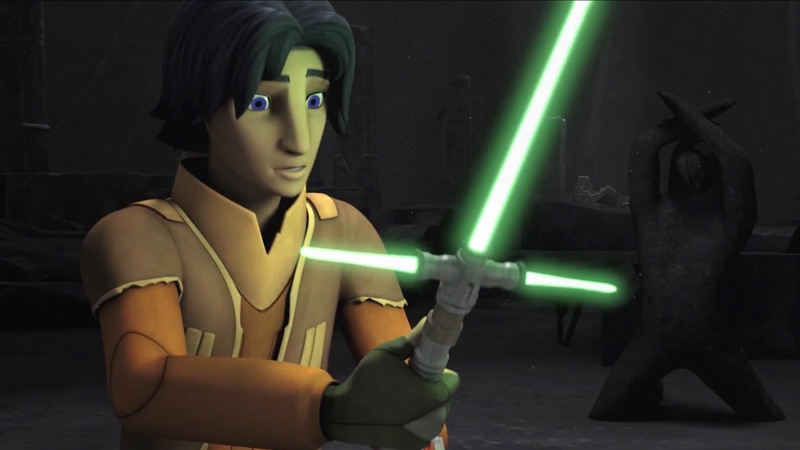 And Ezra finds the archaic triple-bladed lightsaber we saw in The Force Awakens. 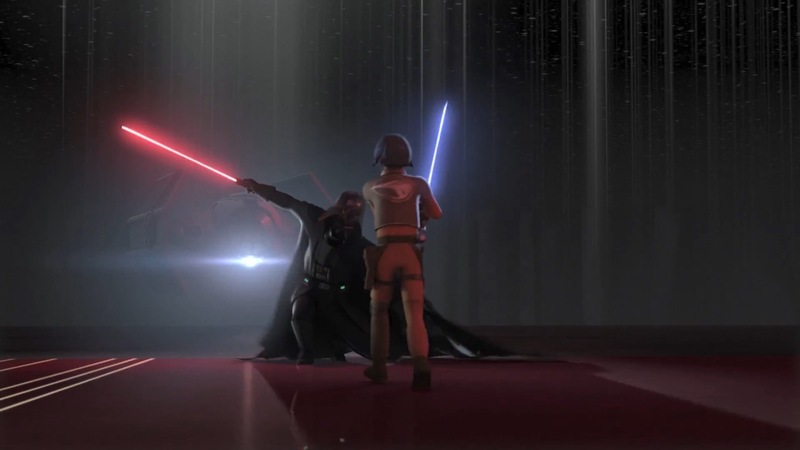 So Kylo’s design isn’t new.